We first met Gail and Craig at the Great Lakes Fiber Festival, where I was ogling the framed pictures of Gail's babies - her Shetland sheep- displayed among her beautiful wool pillows, wall hangings and other textile goods. Through our short conversation, I learned that Gail, originally from Ohio, moved out to California to work in the fashion industry, where she met Craig. After years of living on the West Coast, they decided to move back to Ohio buy an old farm, have some chickens, and sell veggies at the Farmer's Market. After a few years, they refined their interests and settled into their passions: Sheep and Grapes (or, more specifically: wine!). I was afraid of taking up too much of her time with all of the customers swarming her booth at the fair, but I felt like I could just keep talking to them! Lucky me, Gail and Craig invited Sarah and I down for a farm visit. Invitation accepted! We were instantly charmed by the property, which offers such idyllic views: pastured sheep to the left, vineyards to the right (...and back, and anywhere grapes will grow!) and an incredible, restored red barn at the end of the driveway. "It's amazing what you can do with 5 acres!" Gail said at one point during our conversation, and their happy sheep and grapes are evidence of their detailed stewardship of their land. As we walked around the property, conversation flowed easily between farm management, personal interests, and philosophies on regenerative agriculture, repurposing consumer goods, conservation efforts, and farmer connections. Whether it be tending to the sheep or the grapes, they have a relationship with these systems. Gail's connection with her sheep is obvious. They simply adore her. "The best thing you can do is go out with a stool and sit with your flock, and they'll come up to you and tell you if something is wrong. Some just give me gratitude for a minute of the day." And we adored spending time with them! It didn't hurt that Gail named each one after some sort of sweet treat, (Churro, Macaron, and Muffie were our faves) which seems about right for these guys! Meet churro. One of the few males on the farm. Gail does process some of her raw fiber into roving and yarn, but she expressed the concern that many fiber farmers in the Rust Belt Fibershed have: most mills aren't set up for small scale orders. She mostly uses the raw fleece to make both functional household objects: such as dryer balls and loofas, as well as gorgeous felted rugs with a texture that makes me want one in every room. Naturally colored roving from Gail's flock. Grey Oatmeal Mogat wool. In our humble opinion, the perfect natural color. Gail sells out of a rug as soon as it is made, but here is a small sample to satisfy your curiosity. So good! We will take two extra larges, please! 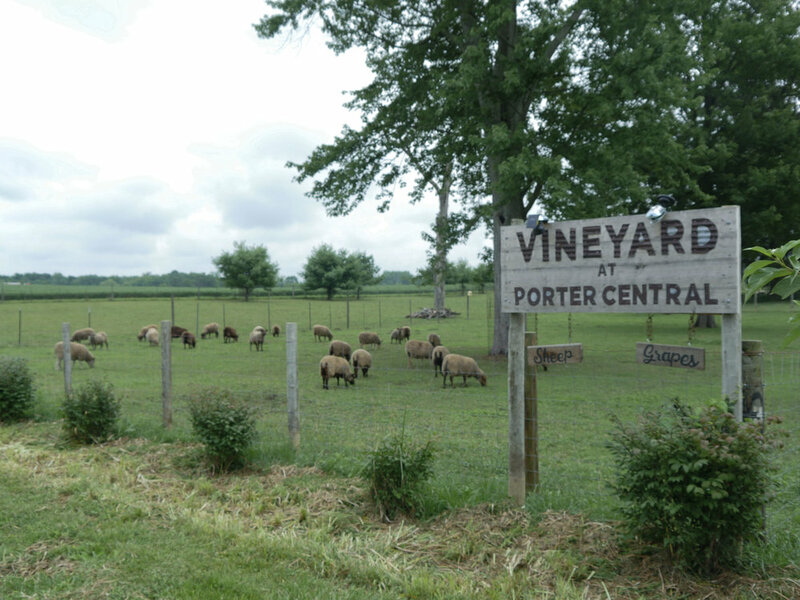 Their system is regenerative- the sheep are pastured through the grape vines to manage the grass, their manure is composted along with the waste from the winemaking process, and is eventually used as fertilizer. The grapes are definitely evidence of the health of the soil. Craig shows us his wine cellar and graciously pours us samples from a couple of different carboys. 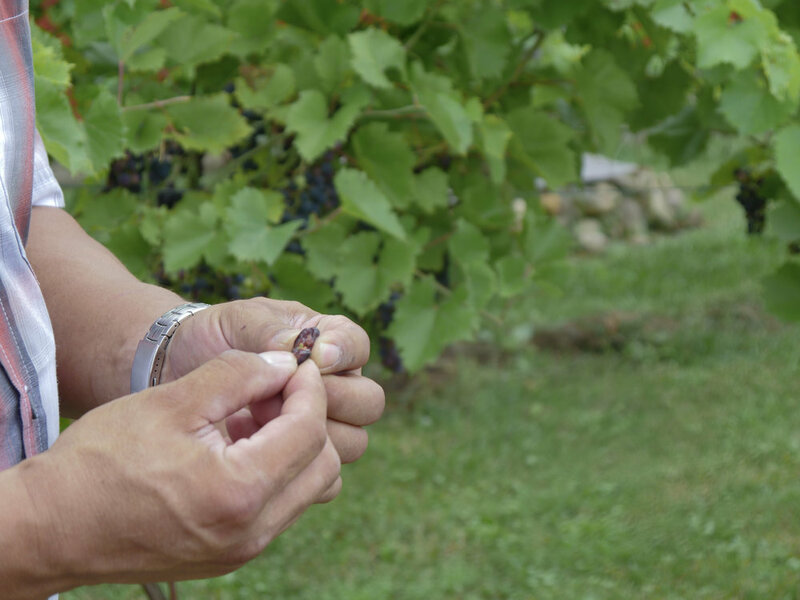 As we sip and talk, he tells us that he is working to control the sugar content so that the wine is less sweet, (sweetness is usually a staple of Ohio-made wines). For those of us who like drier wine, the flavor is incredible. 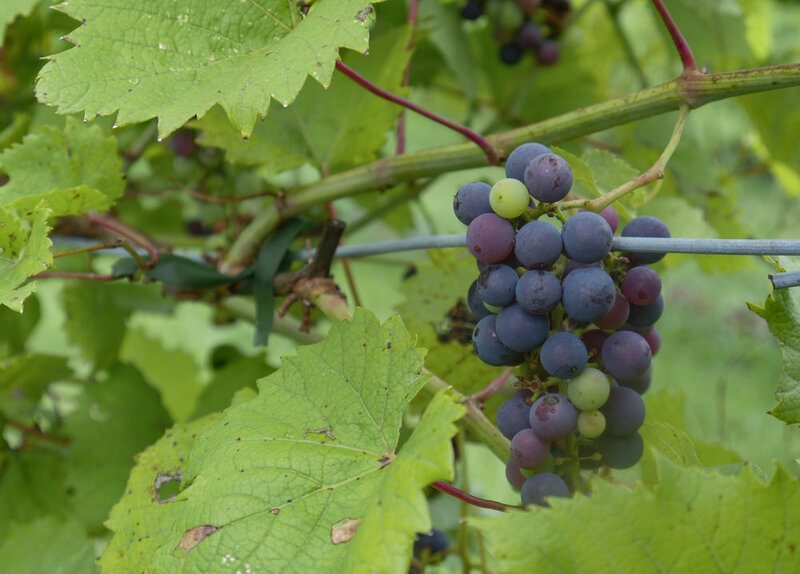 Currently he is growing Catawba and Cayuga grapes. His operation is small and manageable as he works to perfect his recipes, and he plans to open a tasting room in their barn soon. While these two have plans for growth (Gail would like to create pillows and bedding with fiber and Craig would like to open a tasting room in the barn), we are in love what they are currently accomplishing for our region.